This dish so is easy and so delicious that I make different versions of this recipe all the time. 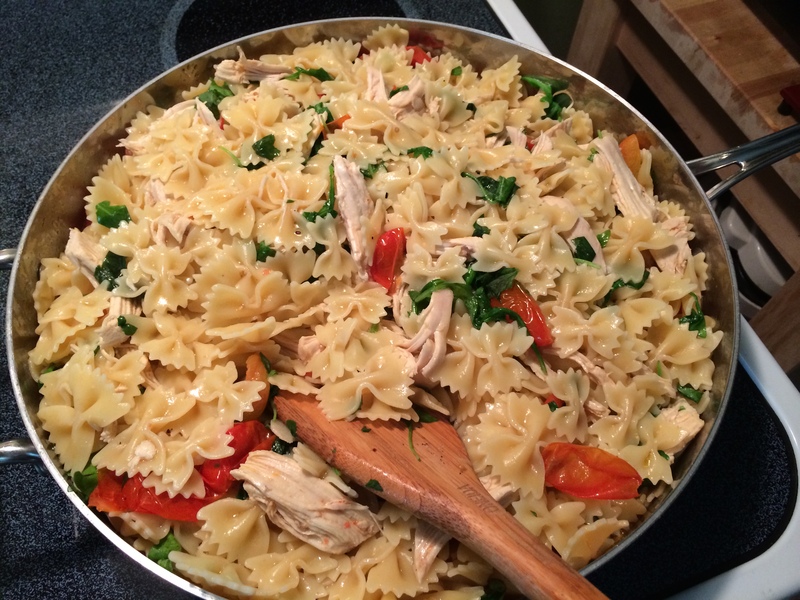 In my house we love pasta, every which way you can think of, so changing it up is always fun. I thought about how much we love tomatoes, fresh mozzarella, and basil, that to, toss that in with pasta, well, I’m just sayin’. For this dish I also roasted off 2 chicken breasts, bone in and skin on. The chicken always comes out so moist and flavorful when cooked this way. First In a large pan, one that is somewhat deep, not shallow like a saute pan, I add 1/3 cup of olive oil. I know that sounds like a lot, but remember this is the base for our sauce. To the olive oil I add 1 tablespoon of crushed red pepper flakes and I slice 6 large garlic cloves and toss that in to the cold olive oil. 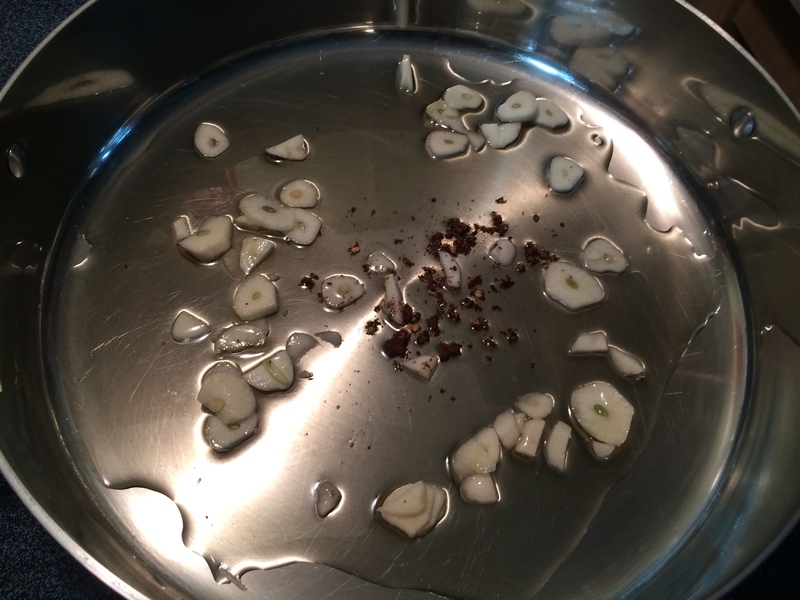 Turn the heat on med low so that the garlic will infuse with the oil. I let this slowly cook the garlic without letting the garlic turn brown and bitter. So you have to watch it carefully. Once you start smelling the aroma of the garlic then I add in 2 pints of grape tomatoes that I sliced in half. I then season with 1 tablespoon of Kosher salt and 1 teaspoon of black pepper. 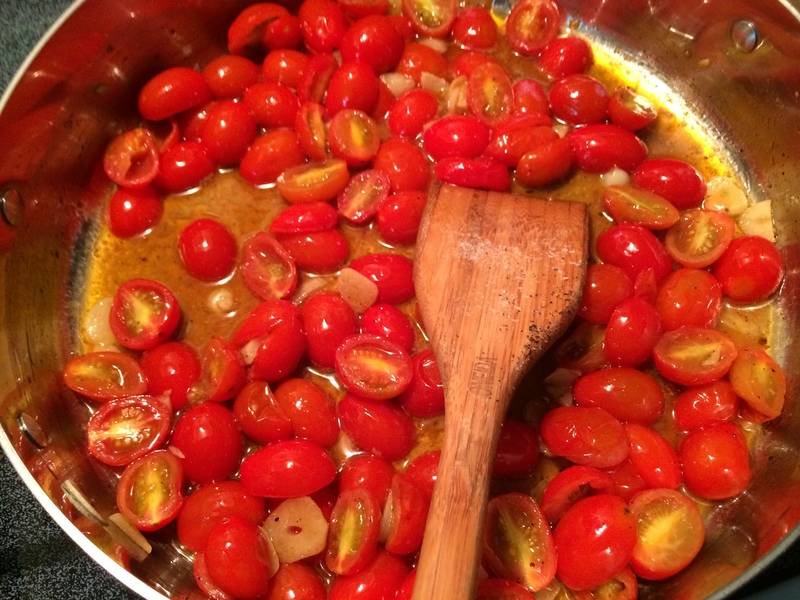 I let the tomatoes simmer with the garlic until the tomatoes just start to break down. At this point, the chicken that I roasted in the oven should be ready to pull out. 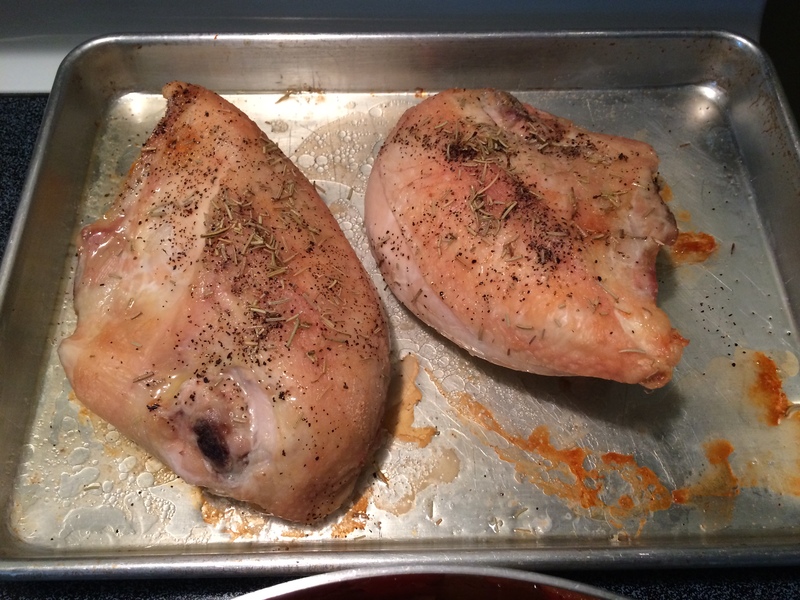 All I did for the chicken is set the oven to 350 degrees, drizzle with a little olive oil, Kosher salt, pepper, and a pinch of dried rosemary and cook to 35-40 minutes. While the tomatoes are simmering away, let the chicken cool enough so you can handle pulling the skin off, removing the chicken from the bone. I like shredding the chicken rather than dicing for this dish. 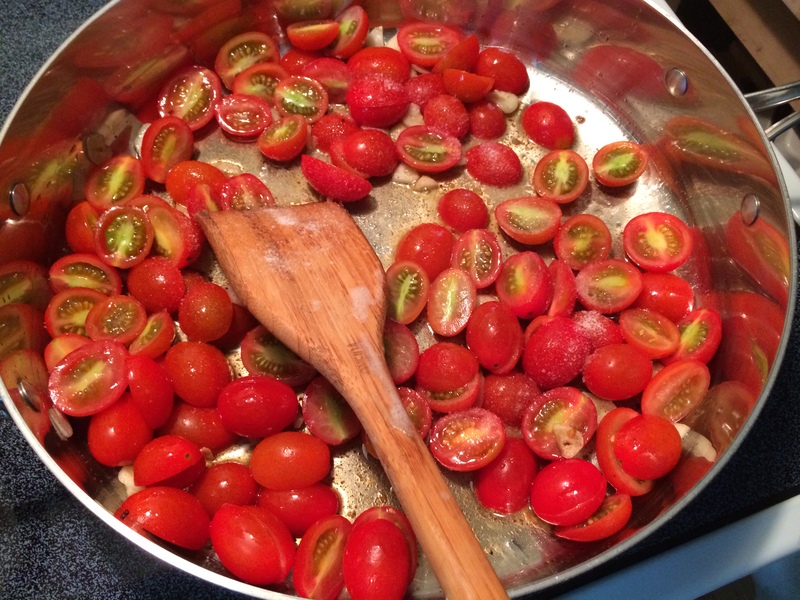 As you can see the tomatoes are starting to break down and make a sauce that’s going to coat the pasta and chicken. 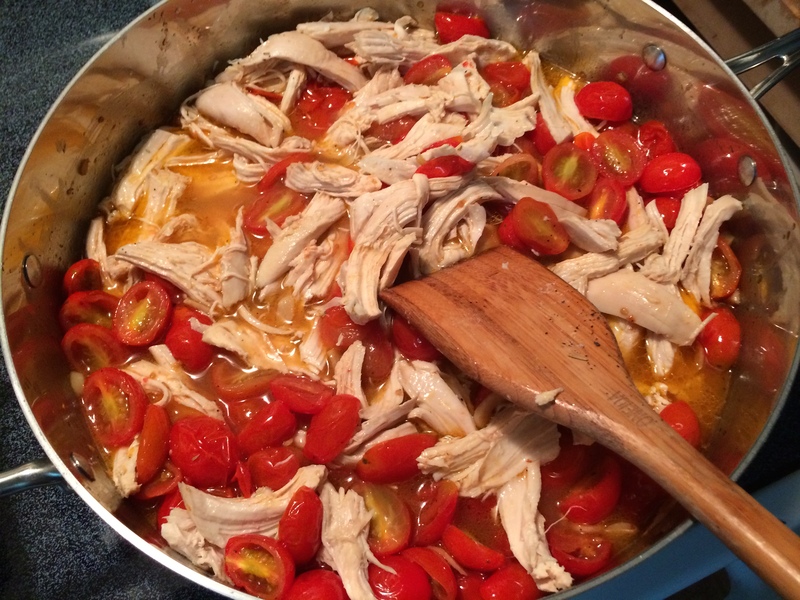 So once the chicken is ready just toss it in with the tomatoes and garlic. Looking good! Now I add 1 cup of low sodium chicken broth to the pan and let this simmer another 15 minutes or so while I dice up the mozzarella, and chop the fresh basil. 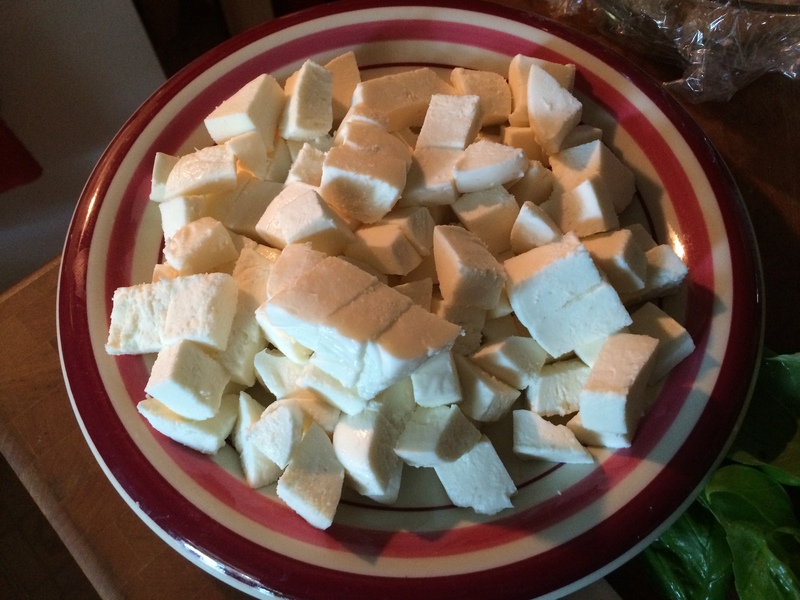 While I’m dicing the mozzarella, I have a large pot on the back burner starting to come to a boil for the pasta. Always salt the water liberally, that your going to cook the pasta in and then cook the pasta to just before the Al dente stage because it’s going to cook a little longer when you add it to the chicken and tomatoes. Now strain the pasta but reserve 2 cups of the starchy pasta cooking liquid. I tell you why in a second. Add the pasta into the pan, stir everything together. At this point I toss in the fresh basil that I chopped and about 2 cups of fresh arugula and mix until the green start to just wilt. 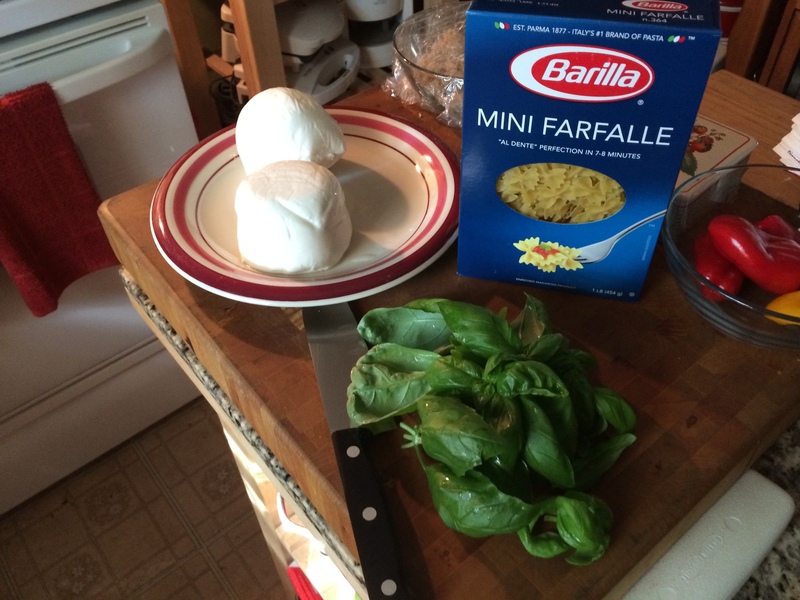 Finally toss in the diced mozzarella. The pasta will absorb the liquids pretty quickly so this is when I start to add the starchy pasta liquid and it will loosen and bring the sauce right back. 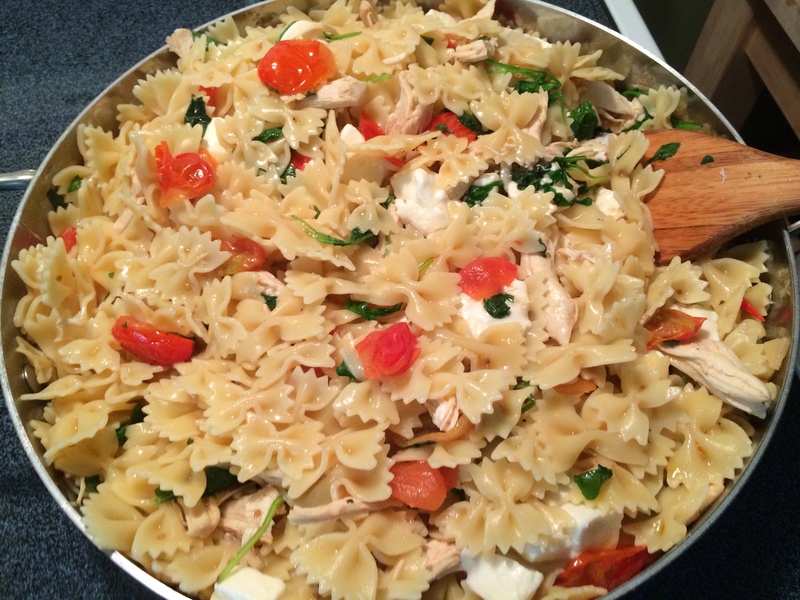 Well that’s it, Farfalle Caprese With Roasted Chicken And Arugula.